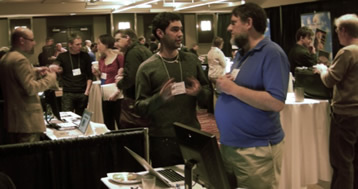 Get an overview of MW2010 activities day by day, or see Key Dates for events leading up to the conference. A head-start on MW2010 was offered through pre-conference tours, with a chance to see behind-the scenes at local cultural institutions. A special pre-conference invitational workshop also took place on Tuesday. Pre-Conference Workshops took place on Wednesday. Full and half day sessions offered by experts in the development and application of museum computing and Web technologies provided a chance to learn new skills. All workshop registrants were invited for lunch.New MW2010 friends met at the Welcome Reception on Wednesday night. Workshops on Wednesday required separate registration. MW2010 opened with a Plenary Session on Thursday. The day continued with concurrent theme-based conference sessions, and ended with a set of informal unconference sessions. Thursday wrapped with the Exhibitors' Reception and the opening of the Exhibit Hall. The middle day of the MW2010 conference offered something for everyone. The Exhibit Hall was open all day, offering a chance to review technologies and service to help build a museum's Web presence. Demonstrations of Web sites by museum professionals provided a great chance to see museum Web sites up close and ask questions about their goals, objectives and methods, and a Birds of a Feather Lunch provided a chance for conversation. The Crit Room offered live critique of museum Web design, and the Usability Lab illustrated methods of evaluating a Web site from a user's perspective, quickly and efficiently. Friday closed with the Best of the Web Awards, and then the Conference Reception. The final day of MW2010 began with Mini-workshops and Professional Forums. A mid-day plenary explored topical issues. Concurrent sessions on a theme followed. MW2010 wrapped with a Closing Plenary.